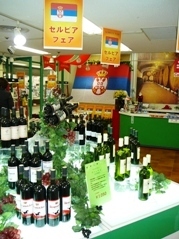 The first ever mini bazaar of Serbian products was opened at Sunshine City, Ikebukuro, on December 22, 2007. 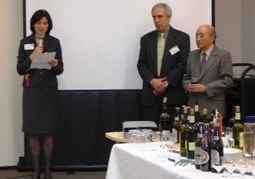 It was organized by the Japan – Serbia Cultural Exchange Association, the Embassy of Serbia in Japan and the company "Adria International Co. Ltd.". 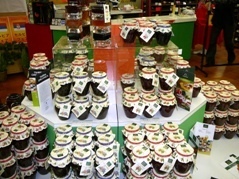 It offers a wide variety of best quality Serbian wines, spirits, home made fruit preserves, traditional handicrafts and souvenirs. The opening ceremony was attended by around 100 guests from various Japanese institutions and companies, friendship associations, etc. The proceeds from the Bazaar will be used for financing the construction of a Japanese cultural center and budokan in Belgrade. 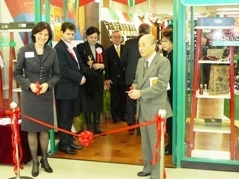 The bazaar will be opened until January 20, 2008. On December 23rd, Serbian Post issued commemorative postage stamp and first day envelope as part of celebration of 125 years since the official correspondence between the ruler of the Kingdom of Serbia and the Empire of Japan was exchanged. During the Berlin Congress, on July 13th in 1878, Serbia became an independent and internationally recognized state, and on March 6th in 1882, was proclaimed Kingdom. Milan I Obrenovic was the first Serbian king after the liberation from the Turks, the first sovereign after the Nemanjic family, and a representative of the dynasty which originated from its own people. He addressed to the Japanese Emperor and great reformer of that time Meiji, informing him about his coronation and the international recognition of Serbia. In the written answer of Emperor Meiji, Japan recognized Serbia as an independent state which led to the formal establishing of relations between two monarchies and beginning of official diplomatic correspondence between two sovereigns. 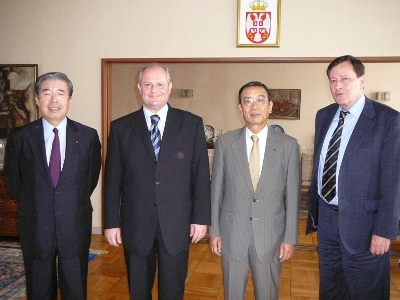 Delegation of the Ministry of Foreign Affairs of the Republic of Serbia, headed by the Assistant Foreign Minister Ambassador Cedomir Radojkovic, Director General for Bilateral Affairs, visited Japan on December 10 and 11, 2007. 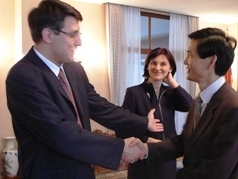 Representatives of the Serbian Ministry of Foreign Affairs held talks with the representatives of the Ministry of Foreign Affairs of Japan, headed by the Director General of the European Affairs Bureau, Mr. Chikahito Harada, on future cooperation between the two Ministries, as well as about the overall bilateral relations between the two countries. 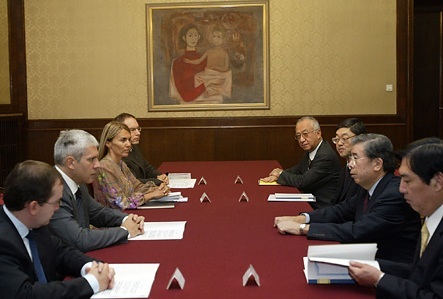 They were also received by the Vice Minister of Foreign Affairs, Mr. Masakatsu Koike. 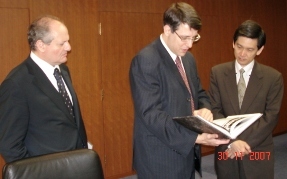 High officials of the Ministry of Foreign Affairs of the Republic of Serbia, Assistant Minister for Bilateral Cooperation ambassador Cedomir Radojkovic and Director of the Directorate for Asia and the Pacific ambassador Stanislav Stakic, met with the Vice President of Japan International Cooperation Agency (JICA) Mr. Seiichi Nagatsuka at JICA headquarters in Tokyo. They were accompanied by H.E. Ambassador Ivan Mrkic and Counsellor for Economic Affairs Mr. Nebojsa Tasic. 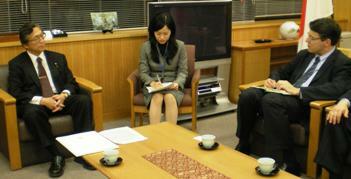 Serbian officials exchanged views with Vice President Nagatsuka on enhancing cooperation between Serbia and Japan. This year, the Embassy of Republic of Serbia celebrated 125 years of the very beginning of diplomatic correspondence and diplomatic relations between Kingdom of Serbia and Empire of Japan. 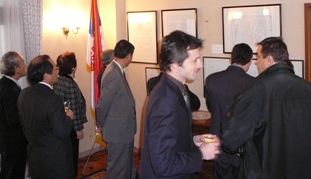 The copies of the original letters from that time, obtained from the Diplomatic archives of Japan and MOFA, were displayed as an exhibition during the Embassy's reception in the occasion of the visit of Serbian Minister for Energy and Mining dr A. Popovic to Tokyo, on November 30th, 2007 (for more, please click here). On March 10th, 1882, King Milan I Obrenović wrote a letter to Japanese Emperor Meiji, informing about his coronation as the sovereign of the Kingdom of Serbia. By replying to this letter on September 27th, 1882, Emperor Meiji not only congratulated Serbian king on his coronation, but confirmed the recognition of the newly established Serbian state. After long period under foreign occupation, Serbia became independent and internationally recognized state on July 13, 1878 during the Congress of Berlin. On March 6, 1882, Serbia became a kingdom. The first time Serbia was pronounced kingdom was in 1217, when Stefan Prvovenčani, from Nemanjić ruling family, was crowned its first sovereign. For details about Serbian medieval history, please see the following link: http://www.serbianembassy.jp/ENGLISH/Medieval.html . On invitation of The Ministry of Foreign Affairs to join ten-day group study tour of Japan, 15 representatives from Central and South East Europe arrived to Tokyo on December 2. This year two participants from Serbia are joining the program - Mr. Miloš Milovanović, adviser in the Ministry of Agriculture, and Ms. Biljana Stojaković, journalist in Cultural Section of major daily newspaper "Politika". The openning reception was held in the Tokyo Prince Hotel on December 3rd, with representatives of MOFA and embassies from invited countries. It is hoped that in the longer term, the applicants deeper understanding of Japan gained in the tour will contribute to strengthening future ties between Japan and European countries. In the 29th Yomiuri International Cartoon Contest held this year in organization of daily newspaper "Yomiuri Shimbun", among more than 6000 candidates, Serbian participants Mr. Arsen Lalic i Mr. Uros Maksimovic won the Sepcial Overseas Junior Prize. More information is available on the web site: http://info.yomiuri.co.jp/prize/cartoon/ . At the annual International competition in haiku poetry (category English language), held in Hekinan-city in Aichi Prefecture, Special award went to Ms. Svetlana Stanković. 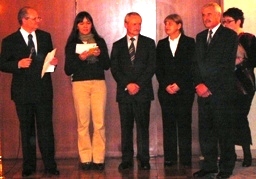 Other Serbian participants, awarded as Runners-up, are Mr. Branislav Brzaković, Ms. Jasminka Nadaskić-Đorđević and Ms. Rajna Begović. The cocktail reception, hosted by H.E. 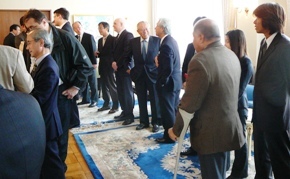 Ambassador Ivan Mrkic in honour of Minister dr A. Popovic, was attended by the members of Parliament, officials of the Government of Japan, representatives of leading corporations and companies, members of the academic circles, the diplomatic corps and media. Among prominent guests were Mr. Ichiro Aisawa, president of the Parliamentarian League of Friendship Japan-Serbia, Ms Akiko Yamanaka, member of the Parliamentarian League, Mr Chikahito Harada, Director General, European Affairs Bureau, MOFA, Mr. Seiichi Nagatsuka, Vice President of JICA, Mr. Hideo Matsui, Senior Executive Director, JBIC, ambassador Takehiro Togo, president of the Association for Interchange Japan-Serbia, Ms Yasuko Hamada, Vice President of the Association, Mr. Sumitaka Fujita, Vice Chairman of ITOCHU, Mr. Hanazawa Kazuyoshi, President, Sankyo and numerous high officials of various Japanese companies. Displayed for this occasion were copies of the original letters exchanged between King Milan I Obrenovich of Serbia and Emperor Meiji by which diplomatic relations between Serbia and Japan were established 125 years ago. These historical documents attracted great attention. Minister Popovic met with Vice Minister of Foreign Affairs Mr. Masakatsu Koike and had comprehensive talks on enhancing bilateral cooperation in the sectors of mining and energy and in environmental protection with Senior Vice Minister for Economy, Trade and Industry Mr. Masashi Nakano, Vice President of JICA Mr. Seiichi Nagatsuka, Governor of the Japan Bank for International Cooperation (JBIC) Mr. Koji Tanami, President of the Parliamentary league Japan - Serbia Mr. Ichiro Aisawa and the high officials of some Japanese companies. 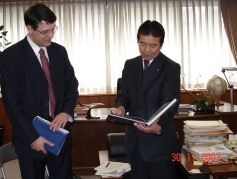 During his two day visit to Japan, Minister of Energy and Mining of the Republic of Serbia, Dr. Aleksandar Popovic, met with the Vice Minister of Foreign Affairs of Japan, Mr. Masakatsu Koike, on November 29, 2007. Minister Popovic and Vice Minister Koike exchanged views on the possibilities for further enhancement of cooperation between Serbia and Japan in various fields. On behalf of the Government of the Republic of Serbia, Minister Popovic expressed his gratitude to the people and the Government of Japan for their generous economic assistance to the people of Serbia. He conveyed the letter of Prime Minister of Serbia Dr. Vojislav Kostunica addressed to the Prime Minister of Japan, Mr. Yasuo Fukuda. In collaboration with the Embassy of Serbia in Tokyo, JICA and "Mitsui Mineral Development Engineering Co., Ltd." (MINDECO) organized a seminar at JBIC headquarters in Tokyo on investment promotion in Serbia, which was attended by around 100 representatives of Japanese companies. Its main topic was promotion of investments in the mining sector and related industries in Serbia. Similar seminars, also funded by JICA, will be held next year in London and Toronto. 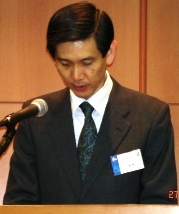 Vice President of JICA Mr. Seiichi Nagatsuka was the keynote speaker. H.E. Ambassador Ivan Mrkic and Assistant Minister for Mining and Energy Mr. Dejan Rajkovic also were among the speakers. From the Japanese side, presentations on very attractive business and investment climate in Serbia were given by Mr. Yuji Nishikawa, General Manager of MINDECO and Mr. Hiroshi Yamamoto, Vice President, Tobacco Business Planning, Japan Tobacco International. JTI made a successful investment in the production of top brand cigarettes in Serbia. 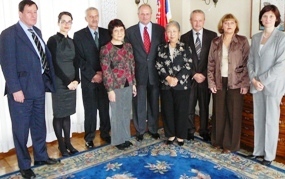 Members of the Serbian delegation, H.E. 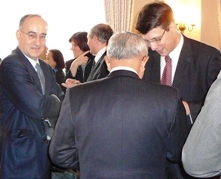 Ambassador of the Republic of Serbia to Japan Mr. Ivan Mrkic and Economic Counsellor Mr. Nebojsa Tasic, participated in this international forum, which was organized by The Global Forum of Japan, under the auspices of the Ministry of Foreign Affairs of Japan. 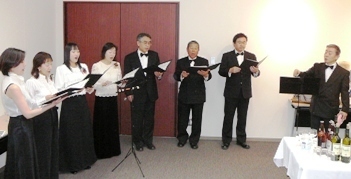 Its main theme was "Japan and the Wider Black Sea Area in the Rapidly Changing World". Ambassador I. Mrkic was one of the panelists at this conference. Other panelists were high officials of the Ministry of Foreign Affairs of Japan, representatives of nine member countries of the Organization of the Black Sea Economic Cooperation (BSEC), its Secretary General Leonidas Chrysanthopulos and representatives of the EU and various Japanese universities and institutions. Serbia was chairing BSEC from November 1, 2006 to April 30, 2007. On November 21, the Honorary Consulate General had a pleasure to welcome a group of students from "Tatetsu Higashi High School" from Kansai region. After a presentation on Serbian history by Honorary Consul General, Mr. Naohide Ueyama, he and the Head of the Serbian Embassy's Culture and Press Section, Aleksandra Kovač, had the opportunity to engage in lively discussion with students about various topics regarding Serbian lifestyle, education, sport and culture. Representatives of the National Employment Service of the Republic of Serbia Mrs. Tamara Samardzic (Director) and Mrs. Vesna-Raca Radisavljevic (Deputy Director) participated in the workshop, study visit and Managing Board Meeting "WAPES in Japan 2007" (Tokyo, November 13-16, 2007), organized by the World Association of Public Employment Services. This event was hosted by the Employment Security Bureau of the Ministry of Health, Labour and Welfare of Japan. The Managing Board unanimously elected the Serbian National Employment Service as WAPES Regional Center for South-Eastern Europe and the Balkans. Mr. Pavel Babka, director of International Ethno Center Babka in Kovačica village in Serbia, held a lecture on "Rise and Perspectives of Serbian Naive Art" at the lecture hall in Tokyo Metropolitan Art Museum. He introduced some current issues facing naive art in Serbia, like globalization, human treasure inscription, non-material culture preservation etc. One of the guests from Serbia, award-winning artist Mr. Jan Glozik, whose artworks are the part of this exhibition, also talked about his extensive lifework and experience. The audience, consisting of the representatives of Museum, Association for Interchange Japan-Serbia, Modern Naive Art Of Japan Association and Museum visitors, was welcomed by Embassy representative, Ms. Aleksandra Kovač. In very exciting and to some "an epic" match, held on Sunday November 4th, within "2007 FIVB World Cup Volleyball for Men and Women" (November 2 - 16), Serbian team won against Japan with 3:1. Both teams played their best, with each team member displaying their talents. The further information are available on official web site 2007 FIVB World Cup Volleybal lhttp://www.vbworldcup.jp/2007/en/ . 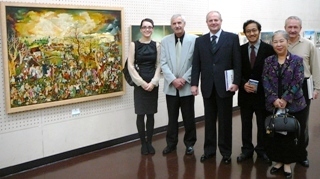 On November 2nd, the Embassy held a reception to mark the opening of Serbian Naive Art Exhibition at the Tokyo Metropolitan Art Museum (until November 12, 2007). After delivering the message of Serbian Minister for Foreign Affairs, Mr. Vuk Jeremić, supporting this cultural event, T.Togo, president of Friendship Association, Ambassador I. Mrkić and Mr. Nishikawa, President of Japan Modern Naive Art, made speeches on this exceptional occasion, presenting unique artworks from Serbia. 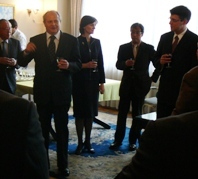 Distinguished representatives of public and cultural elite, and representative of diplomatic corps could be seen among numerous guests at the reception, enjoying Serbian food and famous fruit liquor - rakija. With almost 70 artworks from the Art Gallery Babka from Kovačica village, not so far from Serbian capital Belgrade, this event is the first to be organized in Japan. The next ones are planned to be in Oita and Hiroshima prefectures and Tama city during 2008. 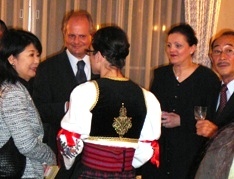 The exhibition, aiming to further strenghten cultural relations with Japan, was organized by Association for Inter-change Japan-Serbia, Modern Naive Art of Japan, International Ethno Center Babka Kovačica, and with the support of Government of Serbia, Ministry of Culture, MFA of Serbia and the Embassy in Tokyo It is to be underlined that without personal effort and enthusiasm of Ms. Akiko Igaya and Ms. Yasuko Hamada this event would not have been possible. 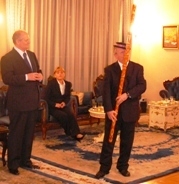 Ambassador of Slovakia, H.E. 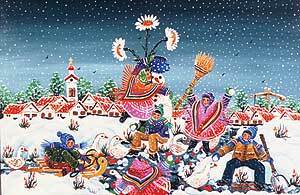 Mr. P. Vrsansky is displaying his musical talent on national instrument "fuyara"
After more than 20 years, Serbian naive art paintings are coming to Tokyo, within 33rd Japan Naive Art Society Exhibition in Tokyo Metropolitan Art Museum, from November 2 – 12, 2007. Don’t miss this rare opportunity to see the paintings from the collection of "International Ethno Center Babka Kovacica" from Kovacica village (http://www.babka-center.com) and other parts of Serbia. The entrance fee for adults is 700 yen. Additional information about the exhibition are available on the Museum's web site (http://www.tobikan.jp/) and of http://www.gendoh.jp/topics/index.html). During an annual event organized by Kyoto City under the name "Kyoto International Community House Open Day" (KICH) on November 3rd, friendship society Serbia-Japan "St. Nikolay of Japan" will be presenting Serbian food and culture and is inviting all interested to join them in tasting of famous dishes and learning more about our country. Serbian women volleyball team will participate in “2007 FIVB World Cup Volleyball for Men and Women” (November 2 – 16). 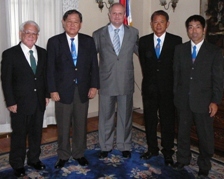 During 2006 FIVB Volleyball World Championship in Japan, the Serbian team scored the third place (http://www.2006vball.jp/en/top.html). Serbia vs. Japan game is scheduled for November 4th, starting at 6:00 p.m. local time. On October 29th, Mr. Jan Glozik, one of four representatives of Kovačica village in Serbia, celebrated his 50th birthday in the Tokyo restaurant „Darie“ in a warm and home-like atmosphere, with Japanese friends and partners, and Embassy's staff. This event was arranged by Ms. Akiko Igaya and Ms. Yasuko Hamada, members of Association for Interchange Japan-Serbia, who are also main organizers of Serbian Naive Art Exhibition in Japan. For further information on the exhibition, please see following link. Violin performance by Mr. Hasegawa’s daughter – a surprise present for Mr. Glozik! Upon the invitation of the Gunma Prefectural Women's University, Counselor of the Embassy of Serbia in Japan Mrs. Snezana Jankovic gave lecture about Serbia to the students of the University and citizens of the Takasaki City. Along with the presentation of natural and tourist attractions of Serbia, Mrs. Jankovic presented the primary goals of Serbian foreign policy, results of the ongoing economic reforms, as well as Serbian activities and initiatives in the international arena. She also pointed out that bilateral relations between Serbia and Japan have a long history of friendship and expressed her hope that exchange of students and cooperation between the universities of the two countries will contribute to their further enhancement. On October 26, Deputy for Cultural Affairs Ms. Aleksandra Kovač was invited, along with two other colleagues from Poland and China, to address the auditorium of the Silver Jinzai Center in Fuchu City. Ms. Kovač spoke about working women in Serbia and Japan, and governments’ efforts to introduce new strategies in order to increase the number of women in governmental bodies and decision making process. After their presentations, guests have answered questions and were given memorable hand-made presents by representatives of the Center. The event was also supported by Foreign Embassies Friendship Association. On October 24, Ms. Danijela Bozanic, Counsellor, Ministry of Environmental Protection of the Republic of Serbia, took part in the "Open Workshop", organized by the japan International Cooperation Agency (JICA) and the Overseas Environmental Cooperation Center, Japan (OECC). The other participants were from FYR Macedonia, Moldova, Uzbekistan and the Ukraine. The Open Workshop, which was attended by the representatives of Japanese government institutions and companies, was a part of the JFY Group Training for Kyoto Mechanism Host Countries in SEE and CIS in Tsukuba, Japan (October 15 - 27). This Training Course was held for the first time this fiscal year and will be held on a regular basis every year. 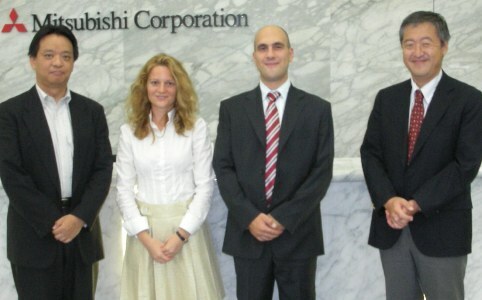 Ms. Jelena Djokovic, attache in the MFA of the Republic of Serbia, will be partipating in the Japanese language program for foreign diplomats and public officials 2007/2008, organized by Japan Foundation and MFA of Japan in the Kansai Japanese Language Institute. This is the third participant from Serbia to be invited to join this program, aiming to enhance Japanese language abilities of foreign service officials in transitional and developing countries. On June 29, UNESCO World Heritage Committee inscribed 22 new sites on its World Heritage List, among which is historical place Romuliana in Gamzigrad, near Zaječar city in east Serbia (http://whc.unesco.org/en/list/1253). The Late Roman fortified palace compound and memorial complex of Gamzigrad-Romuliana, Palace of Galerius, in the east of Serbia, was commissioned by Emperor Caius Valerius Galerius Maximianus, in the late 3rd and early 4th century. It was known as Felix Romuliana, named after the Emperor's mother. The photos of the complex are also available on the following web site http://www.gamzigrad.com/common/gallery . Apart from Gamzigrad, there are more sites inscribed on the UNESCO World Heritage List: Stari Ras and Sopoćani Monastery (1979), Studenica Monastery (1986) and medieval monuments on Kosovo and Metohija, southern province of Serbia (2004/2006). 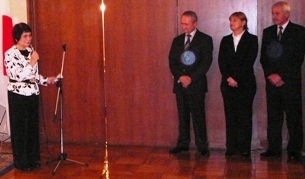 Dr. Ana Pesikan, Minister of Science and Technology of the Republic of Serbia, participated in the annual Science and Technology in Society Forum, held on 7-9 October, 2007 in Kyoto. Dr. Pesikan took part in the Ministers' Round Table, hosted by the State Minister for Science and Technology Policy of Japan, Mr. Fumio Kishida, where she presented the policy of Serbia in Science and Technology, as well as the ongoing cooperation with foreign countries, especially within the programs of the European Union. During the Forum, Dr. Pesikan held numerous talks with the dignitaries from Japan, among them with the Chairman of the Forum, Mr. Koji Omi, the director of the Japan International Science and Technology Exchange Center, Mr. Shuichi Fukuda, and many others. She also exchanged views with the State Minister for Science and Technology Policy, Mr. Fumio Kishida, on the possibilities for further improvement of scientific cooperation between Serbia and Japan. On October 5, Ms. Aleksandra Kovac, head of Cultural Affairs Section, held an introductory lecture about Serbian history, culture, life style and food at the premises of International Friendship Center (IFC). The members of IFC had the opportunity to learn more about our famous hospitability and vivid background of Serbian nation. Attendants were also encouraged to engage in lively discussion, accompanied with some video presentation from Tourism Organization of Serbia. 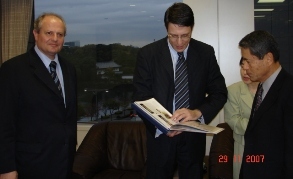 At the 61st Congress of the International Fiscal Association (IFA) held in Kyoto (September 30 - October 4, 2007), the Serbian Fiscal Society was voted into membership of this international organization as its 53rd national branch and the first from South-East Europe. 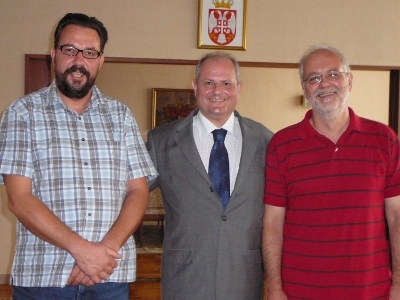 The Serbian Fiscal Society was represented by Mr. Svetislav Kostic, member of its Governing Board and lecturer at the Faculty of Law, Belgrade. A group of representatives of Okinawa Karate-do Association, led by Prof. Shigeru Takamiyagi from International Okinawa University, met with H.E. Mr. Mrkic and third secretary Kovac in the Embassy to greet us before their trip to Serbia. 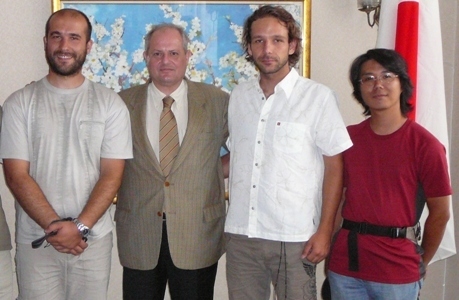 They had been invited to join the programme of "Days of cultural exhange between Japan and Serbia" in Belgrade (September 28 – October 6, 2007), organized by the Embassy of Japan in Belgrade, Ilija Kolarac Foundation, Belgrade University, Novi Sad University and branch of Okinawa Karate-do Association from Belgrade. They will take part in the presentation of karate martial art and Japanese traditional dance and prof. Takamiyagi will also give several lectures on Japanese martial arts and culture. Prof. Takamiyagi, author of Comparative Study between martial art culture in Serbia and Okinawa, expressed his wish that this visit will contribute to further deepening of bilateral relations and to enhancing exhange in the area of karate sport. Serbian Police representative on "Seminar on Control of Drug Offences"
Mr. Dalibor Živković, from Drugs Smuggling Suppression Department of Criminal Investigations Directorate, Ministry of Interion of the Republic of Serbia, took participation in this year's "Seminar on Control of Drug Offences in Tokyo" (September 17 – October 5, 2007), organized by National Police Agency and the Japan Interantional Cooperation Agency (JICA). This is the third participant from Serbia (previously in 2004. and 2005.) taking a part in the event, held annually since 1962. in order to enhance a partnership among the countries fighting against illicit drug trafficking. The reception, marking the opening of the course, was held in the Grand Arc Hanzomon Hotel in Tokyo on September 21, with the presence of the Embassy’s representative. 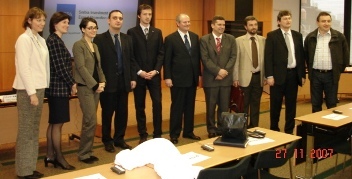 Organized by the network on non-governmental organizations interested in the situation in the Balkans and dealing with the humanitarian affairs in Serbia, a lecture on Kosovo and Metohija was held at the Meiji University in Tokyo on September 22, 2007. Prof. Masayuki Iwata of Tokyo International University, presented his analysis of historical facts that led to the break-up of former Yugoslavia, as well as to the escalation of the so called “Kosovo problem”. 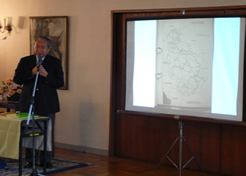 While displaying the material on cultural heritage and Serbian spiritual monuments in Kosovo and Metohija, Prof. Iwata gave his views on the roots of the problem and its consequences on other regions and countries in the world in case of imposed solution or secession of the Province from the Republic of Serbia, as a sovereign country. Two Serbian motocyclists, Dane Medic and Vladan Komatovic, arrived in Japan after their trip across Europe and Asia and visited our Embassy with their Japanese companion, Ryutaro Arima. It was a great opportunity to hear more about their experiences during this long and unpredictable journey, and to realize how valuable it can be for better understanding between Serbian and Japanese nation. Osamu Hirashita, Consultat at Japan Planning Systems and Makoto Watanabe, Executive Director of Tokyu Agency Inc., visited the Embassy to announce their idea of building a statue of Nikola Tesla, great scientist and inventor of Serbian origin. Considering the contribution Tesla made to the world today by his inventions relating to electricity, Japanese guests expressed their intention of erecting monument devoted to Tesla in Otsuka city, Yamanashi prefecture, which is a place of the first electric power plant in Japan. They hope that this project will enable Japanese public to know more about Tesla's work and genious, and that it will strenghten relations between two countries even more. 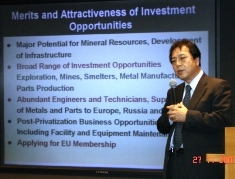 Mr. Hirashita, a renowed businessman, is also organizer of recent lectures regarding economic and investment topics held in Belgrade, with the support of Belgrade Chamber of Commerce and the Embassy of Japan in Serbia. For more information about Tesla, please see here. 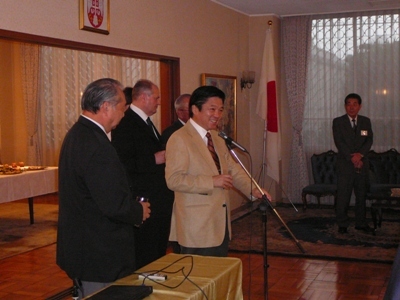 H. E. Mr. Tadashi Nagai, Ambassador of Japan to the Republic of Serbia, gave lecture in the Serbian Embassy in Tokyo on September 19, 2007. 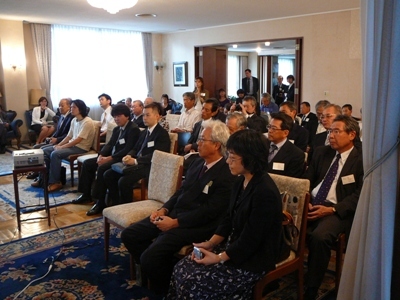 The lecture was organized by the Japan - Serbia Exchange Association. 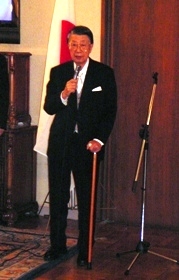 Ambassador Nagai, who spent fifteen years in Serbia as a diplomat, presented to the members of the Association comprehensive information about the political situation in Serbia, his views on the process of negotiations on the status of Serbian Province of Kosovo, as well as about Serbian economic potentials and its bilateral relations with Japan. In view of Ambassador Nagai, one of the most renowned experts on Serbia in Japan, who speaks Serbian fluently, the bilateral relations of our two countries have been traditionally good and friendly. He emphasized the potentials of the overall cooperation, centering on tourism, investment promotion and trade, expressing the importance of further growing of the relations between Japan and Serbia, as the key country in the Western Balkan region. President of the Parliamentary League of Friendship between Japan and Serbia, a member of the House of Representatives of the National Diet of Japan, Mr. Ichiro Aisawa, attended the gathering and delivered a speech. The audience was greeted by the President of the Japan - Serbia Exchange Association Ambassador Takehiro Togo, as well as by Ambassador of Serbia to Japan, H.E. Mr. Ivan Mrkic. 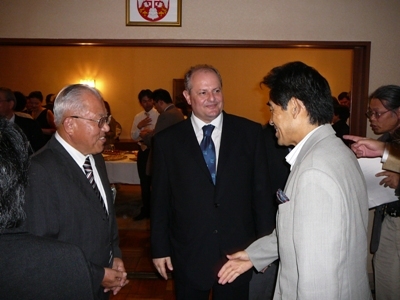 Among the participants was Mr. Osamu Hirashita, President of the consulting firm JPS, who initiated the project of building the statue of the famous Serbian scientist Nikola Tesla in the Yamanashi Prefecture, as well as the group of the Japanese businessmen led by Mr. Hirashita to Serbia this summer. 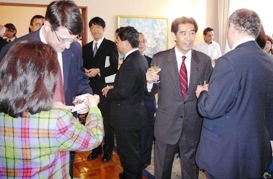 After Ambassador Nagai's lecture, the guests were served with the traditional Serbian food and drinks. 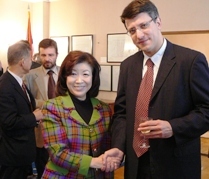 To mark the release of a new album of Serbian musician Milivoje Petrovic, also know as Miško Plavi, the Embassy of the Republic of Serbia in Tokyo held a promotion coctail party and mini concert with performance by Miško Plavi himself on September 18, 2007. It was a good opportunity for his admirers, representatives of diplomatic community, music industry and media, as well as other music lovers, to enjoy his live repertoire with the influence of Serbian traditional sounds. Milivoje Petrovic is an artist with a long career, marked with successes, not only in his native Serbia, but also around the world. He cooperated with music production companies such as Cosmic sounds from London, Virgin from France and with famous French filmmaker Jean Marc Barr. 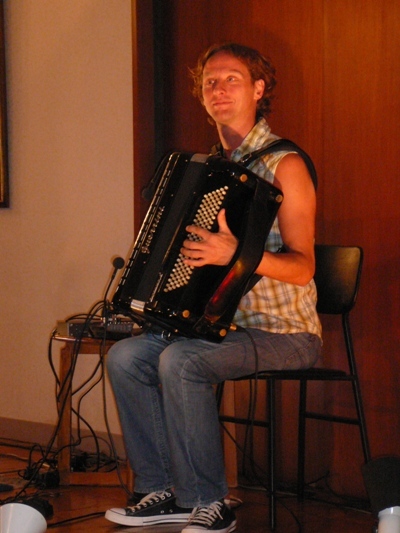 Since 2000, he regularly performs and tours around Japan as an accordion player, either solo or accompanied by his internationally mixed band. For more information about the artist, please visit http://www.jabup.com or www.miskoplavi.com. For the second consecutive year Serbia took part in the JATA World Tourism Congress & Travel Fair at Tokyo Big Sight. 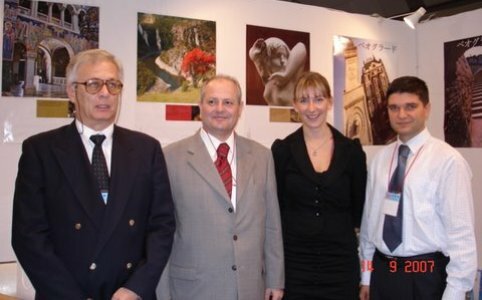 Representatives of the Tourism Organization of Serbia (under the jurisdiction of the Ministry of Economy and Regional Development of the Republic of Serbia) Mr. Predrag Rolovic and of the Tourism Organization of Belgrade Ms. Ivana Milatovic and Mr. Sasa Stevanovic concluded additional arrangements with Japanese agencies for tours to Serbia in 2008, which will substantially increase the number of Japanese tourists visiting our country. 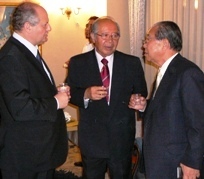 During his visit to Belgrade, Vice Chairman of ITOCHU Corporation Sumitaka Fujita called on President Boris Tadic on September 10, 2007. During the talks, which were held in an affable atmosphere, president Tadic expressed Serbia's strong interest for obtaining a favourable STEP (Special Terms for Economic Partnership) loan from the Japanese Government for the construction of a new bridge over the Danube River in Belgrade. Both sides see promising prospects for expanding the exports of Serbian food and agricultural products to Japan and in promoting mutual cooperation in auto parts manufacturing and chemical industries. Vice Chairman Fujita informed president Tadic that his corporation sees Serbia as the most promising country in the region for the future activities of ITOCHU, which will very soon open its Belgrade Office. President Tadic promised his full support and assistance for the future commitments of ITOCHU in Serbia. SIEPA officials Mr. Bojan Jankovic and Mrs. Tatjana Radovanov attended the first JICA/UNIDO Practical Seminar on Investment Promotion in SEE. This year Serbia and Ukraine were invited to send their representatives. The Practical Seminar is a part of the JICA technical cooperation programs. It is very special since its main goal is interviews, bilateral and round table meetings with the representatives of targeted Japanese companies and visits to different industrial plants. The expertise of our participants will further enhance economic relations between Serbia and Japan and attract investments from the Japanese private sector. Delegation of the Faculty of Architecture, University of Belgrade, headed by the Dean Prof. Dr Vladimir Mako, participated in the International Symposium “Eco Urbanity” in Tokyo. 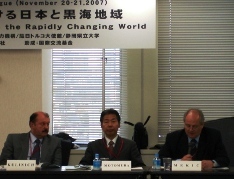 The Symposium was held at the University of Tokyo on September 7 and 8, 2007, and it was organized by Prof. Dr Darko Radovic, guest professor of this university. Many renowned architects from Japan and the world, like Kengo Kuma, Yuichiro Kodama, Hidenobu Jinnai (Japan), Oriol Clos (Spain), Mike Jenks (UK), Arvind Krishan (India), David Sim (Denmark) and others, took part in this important event. In numerous contacts with the colleagues and renowned architects from Japan, Prof. Mako, accompanied by Assistant Professor Zoran Djukanovic, stressed the interest of the Faculty of Architecture in Belgrade to intensify cooperation with the Japanese universities through joint projects and initiatives. Professors Mako and Djukanovic presented to the participants of the Symposium the newly published book “Urbophilia”, as well as materials related to the Faculty of Architecture in Belgrade. Serbian environmental movie “My friend, the Goldfinch”, by Dusan Cekic and Oliver Fojkar, won an award at 8. International Japan Wildlife film Festival in Toyama City, in a category of “the best educational film for children” among 35 selected movies. 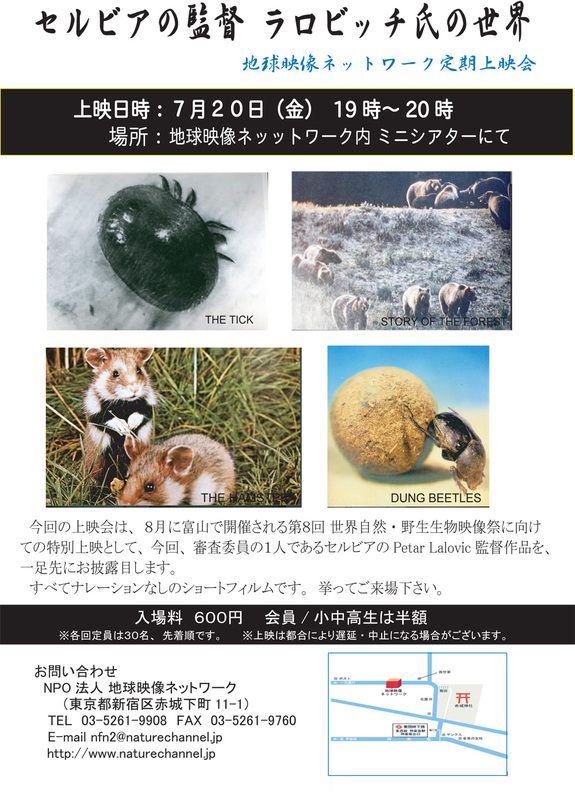 All awarded films will be shown by the end of this year in the Natural History Museum in Tokyo. This was the only representative from South East Europe, chosen among 300 applicants from more then 40 countries in the world. Mr. Fojkar, who received the award, invited his Japanese colleagues to join the International Touristic, Ecological and Sport Film Festival (MEFEST) in Serbia. 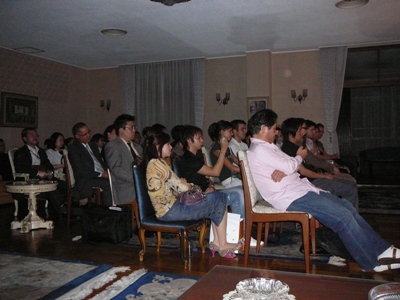 The group of students of Nihon University visited the Embassy in order to have lecture on Serbia. Counselor Mrs. Snezana Jankovic informed the students about the overall situation in Serbia, its main political and economic goals, as well as about its interest to develop relation with Japan in the political, economic, cultural and all other fields. Lecture on Serbia was held for the group of Japanese citizens who had previously been attending the course on former Yugoslavia within the Mainichi Culture City, affiliated with the Mainichi newspapers. Counselor Mrs. Snezana Jankovic gave lecture about present political situation in the country, negotiations on the future status of the Kosovo province, as well as economic reforms and bilateral relations with Japan. On July 24, awarded film “Pretty Diana” by Serbian filmmaker, Boris Mitić, will be shown at 2nd edition of Refugee Film Festival in Tokyo (July 18 - 26). This event is organized by UNHCR, UN Refugee Agency in Japan. The screening will be held at 4 pm at the Embassy of Sweden, it is free and no prior reservation of seats is required. After the screening of the movie, Charge d’Affaires a.i. of the Serbian Embassy Mrs. Snezana Jankovic, will have a brief presentation on the situation of refugees in Serbia. She will present the facts pointing out that Serbia still remains the country which shelters the biggest number of refugees and internally displaced persons in Europe. There are more than 100.000 refugees and 209.000 IDPs from Kosovo and Metohija, while almost 200.000 refugees from Bosnia and Croatia permanently stayed in Serbia, taking Serbian citizenship. Serbia is doing its utmost to help the integration of refugees and IDPs in the society, as well as to enable their return to their homes. However, that process is going on very slowly and, in addition to our own efforts, requires continuing international support and engagement. The complete list of 30 film screenings with the schedule of the Refugee Film Festival is on-line in English and Japanese at www.refugeefilm.org. On July 25, the exhibition of works from the collection of Iwano Atelier will be opened within “Contemporary Art in East Europe Exhibition” in the Echizen City Hall, Fukui Prefecture. The organizer of this event is Tannan Art Festival. To read about the previous display of this artworks, please reffer to the event schedule for April 2007. Talented accordion player, Miško Plavi, will be touring in Japan till beginning of September, promoting his new CD. 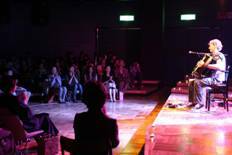 For almost 7 years, Miško Plavi has been coming to Japan to perfom his music influenced by native Serbia and Balkan region, having more than 100 solo concerts. For detailed programme of his concerts, please click here. For more detailed information about this musician and his perfomances, please visit www.miskoplavi.com and http://www.jabup.com/html/artist/2007/misko.html. Awarded Serbian film director, environmentalist and ecologist Mr. Petar Lalović will be taking a role as a member of jury in the “Japan Wildlife Film Festival” to be held in Toyama city, from August 23, 2007. He has created more that 200 documentaries mostly on themes of nature and ecology, with some wining reputable international awards in film festivals around the world. Thus, his presence in this year’s festival will be a great opportunity to share his remarkable experience and knowledge with filmmakers and public in Japan, as well as with other participants from around the world, and to contribute to raising awareness about environmental issues in which Japan also nurtures permanent and profound interest. Also, another awarded Serbian fimmaker, Mr. Oliver Fojkar, will be presented as a finalist in this festival with his movie “My friend the goldfinch”. Velimir Vukićević, renowed ceramic artist and professor of Faculty of Applied Arts in Belgrade, is participating in Seto International Ceramic & Glass Art Exchange Program 2007 - 2008, organized by Seto City Cultural Promotion Foundation. As an artist in residence in Seto, Vukićević will have a slide lecture on July 17 and open studio on August 18. 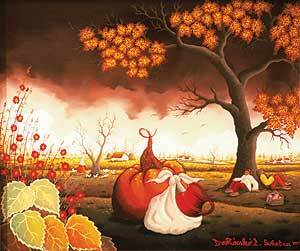 The visitors are most welcome to see the work of this Serbian artist. Our famous jazz trumpet musician, Duško Gojković, is performing again in Tokyo. This internationally recognized artist has been coming to Japan for more than 10 years. There is also a Japanese fan club dedicated to this great musician. For more information about his performances, please visit http://www.pit-inn.com/index_e.html .